Dining table Ø 140cm | Ø 55"
Revisited and reinvented, the new foldable armchair by DEDON is a study in elegant and modern aesthetics. With meticulous attention to detail, a wealth of innovative solutions, intriguing design, materials of character, attractive color combinations and outstanding textures, the armchair is the work of French designer Jean-Marie Massaud, the man behind such monumental projects as the Chivas Volcano stadium in Mexico and the "Manned Cloud" airship hotel – conceived in collaboration with Onera, the French aerospace lab. Massaud’s Sea-X was inspired by the sophisticated allure of some memorable houses and terraces of Palm springs in the ’50s. The result is a structure that is functional, flexible and light yet extremely robust. Made of die-cast aluminium and embellished by the warmth of the teak-finished curved plywood that covers its armrests, the armchair is also available in a glove-like outdoor leather version. Completing the chair are the company’s characteristic technical bearing elements made of woven fabric, which cover the backrest and seat. Available in DEDON’s classic tones — spanning chalk and charcoal, stone and terracotta — Sea-X by Massaud is produced in three variations: dining, lounge and couch. The range also includes a corresponding series of foldable side tables in teak-finished marine plywood.SeaX dining Following on the success of the SeaX folding chair, designer Jean-Marie Massaud has created the jaw dropping SeaX dining table, featuring what must be one of the most impressive tabletops ever developed. Characterized by the same elegance, sophistication and modernity that distinguish the SeaX chair, the new tabletop consists of a single, continuous (there are no joints), self-supporting (there is no frame) slab of porcelain, in lengths of up to 280 cm. Cut by waterjet from the world’s largest porcelain tiles in this thickness (12 mm), extruded and compacted especially for DEDON , the slab has the lightweight look of a streamlined airplane wing – especially in the biggest available size. Measuring in at the same weight as glass, yet structurally far stronger, Lapitec® porcelain is an innovative, natural material with all the richness and durability of stone but none of the shortcomings. The tabletops, their sides attractively exposed, are glazed at a temperature of 1,300° C. Totally non-absorbent, incredibly resistant to scuffing and able to be left outdoors all year long, the tabletops sit atop an aluminum frame of trestle-style construction. 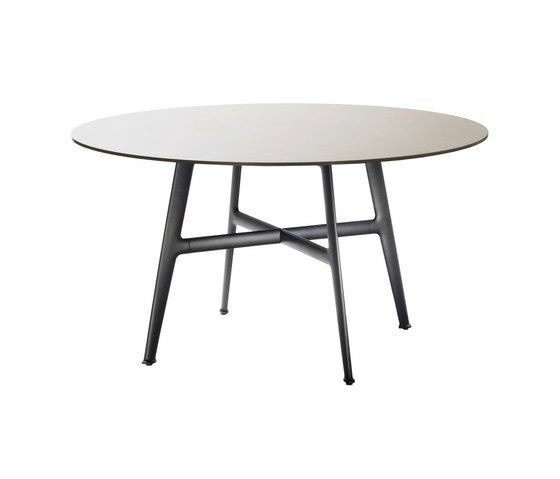 Available in two colors, White and Ebony, the SeaX dining table comes in four sizes, including a circular version 140 cm in diameter.